The singer Shaun is causing endless global boom with ‘Way Back Home’. 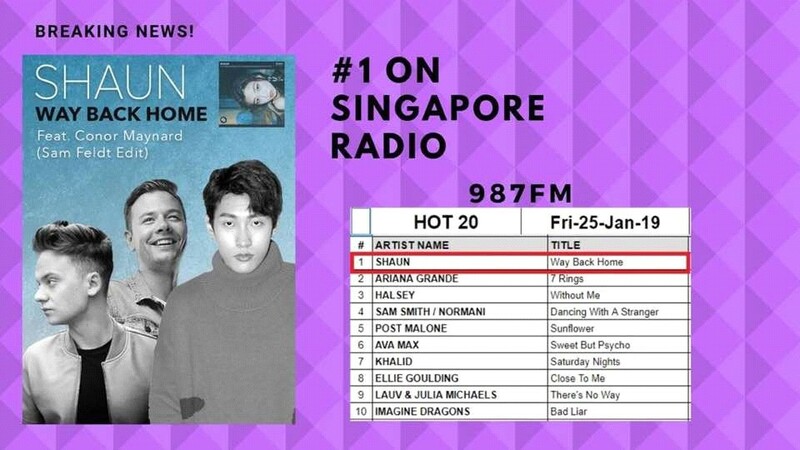 The song ‘Way Back Home’ of Shaun, which has taken over the global music market during the second half of last year, has recorded first in Singapore 987FM Radio Chart on the 4th week of January with its global version. The ‘Way Back Home’, track of the Shaun’s first EP Album ‘TAKE’, is a song with an addictive dart melody line with the unique timbre, which succeeded in long-term ruling of the top one in various online soundtrack charts after its release. In addition to this, he has released a remix pack ‘Way Back Home – The Remixes’ which was with DJ Mosimann by gaining strength from hot interests of the fans abroad, and it was also beloved by fans by the global version of ‘Way Back Home’ which released same time worldwide which was made together with the Netherland DJ producer Sam Feldt, and English Singer Song Writer Conor Maynard. Meanwhile, Shaun has released his second EP album ‘Take’ on the first day of the year and started the year 2019 powerfully, and will continue his music activity with the title song ‘Bad Habits’.